It’s amazing what gets us excited to run. We’re like little kids in a candy shop when we put on our shiny new tennis shoes, or when our fancy new watch arrives in the mail, or we get our tech t-shirt from the race expo. My husband bought me a pair of socks from his Las Vegas trip and I can’t wait to put them on and go for a run. That is seriously demented, right? But it gets us out the door sometimes. I’ve had people tell me they don’t like to run because it’s boring. Running doesn’t have to be boring. If the wind in your face, sun on your back, or view of the Colorado mountains or eastern plains aren’t exciting enough to keep your mind occupied (if you live in CO), then find out what it is that excites you to run. Is it the feeling of conquering something? The knowledge that you overcame the desire to do nothing, or the fact that you know you’re giving your body what it deserves? 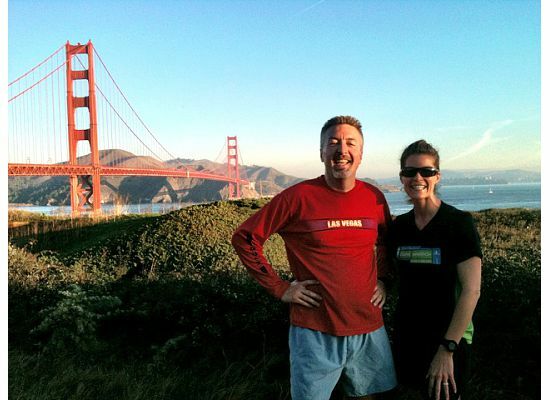 We went to San Francisco in October and my husband had a long run to plan for, which for most people to plan an 11 mile run in a strange city can be daunting. Not for him! He mapped out a route that would run him across the Golden Gate Bridge; a run that I dare say might have been one of his most memorable to date. That doesn’t mean it was an easy run, although there’s something to be said for sea level when you come from Denver, but what it means is that the desire to run overcame all fear of the unknown. I struggled the first few days running in San Francisco. I wasn’t familiar with running in the city and got completely annoyed at all of the traffic and stoplights, and very nearly gave up on the first day until I rounded a corner that led me down a path along the bay and I saw the Golden Gate Bridge gleaning in the sun. Running in San Francisco from there on out was a no-brainer. I knew what was around the corner and even though I dreaded the mile and a half it took to get there, I knew it would be worth it. As humans, we don’t like to stray from the norm. It makes us feel uncomfortable and out of place. Sometimes that’s how it is when we run. Whether you’re a beginner just getting your feet on the road, or you’ve been running for as long as you can remember, there is always some element that sets us aside from the rest of the world. But we know we’re not alone. There are other runners out there going through the same struggles. Other runners who have lost their motivation to lace up. Other runners who, regardless of how well they’ve planned and prepped for a long run, still bonk and end up walking home. And, other runners who are heading out the door, about to round the corner and see what lies ahead. Great post! Denver and San Francisco are two of my favorite places.